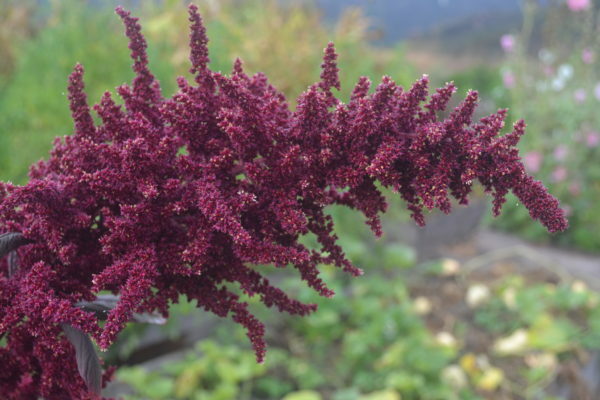 Amaranth is an ancient grain with a history steeped in the Aztec Empire. The Conquistadores attempted to eradicate the plant. However, due to the perseverance of subversive farmers and of the plant itself, amaranth survives today. Read about amaranth’s history here. Although not a grass like the true grains, amaranth seed is often considered a grain. The seed and leaves are both edible, tasty and highly nutritious. Amaranth contains more protein than many grains and is high in calcium, antioxidants and minerals. The high nutrient content and ease of growing amaranth make it an ideal plant for the future. 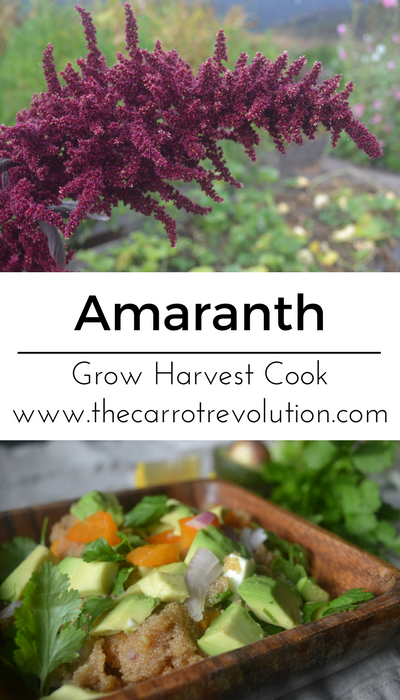 Read on to learn how to grow and cook with amaranth. 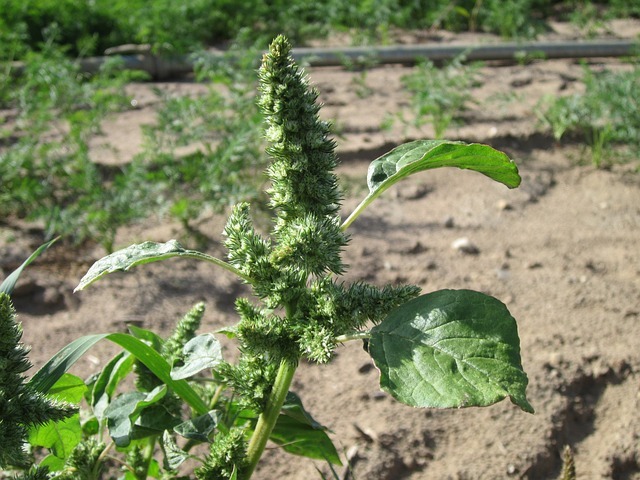 Amaranth shares a family with the common (and edible) weeds; lambsquarters and pigweed. Like these weeds it readily grows in cultivated soil and will self-sow easily if allowed to go to seed. Pigweed (Amaranthus retroflexus), is a close relative of amaranth and considered a weed but can be used in much the same way as amaranth. Unless otherwise noted, amarnath plants can reach 5 to 8 feet tall so make sure you give them some room. Plants need at least 5 hours of sunlight each day. Hopi Red Dye (Amaranthus cruentus x A.powelli): The flower bracts of this variety are used by the Hopi to dye Piki bread. The deep red leaves of this variety work well as microgreens. Green or Red Callaloo: Callaloo is the name given to green amaranth leaves in the Caribbean. Try steaming these leaves in a pot with coconut oil, garlic, pepper and thyme. Pygmy Torch (Amaranthus Hypochondriacus ‘Pygmy Torch’): If you need a smaller amaranth (up to 3 feet) try this variety out. You can also plant pygmy torch amaranth in a container. 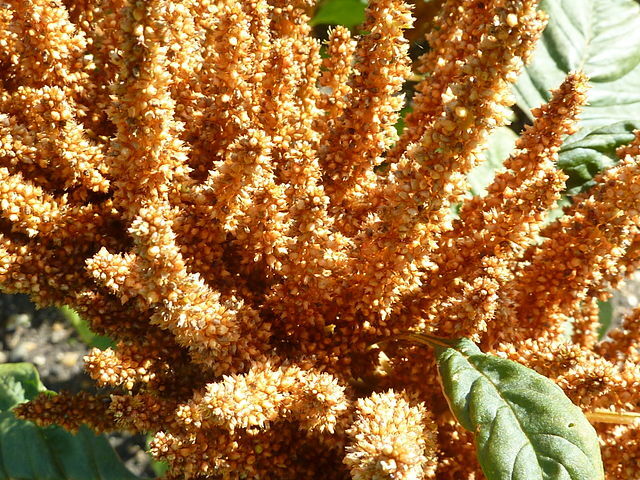 Giant Orange Amaranth (Amaranthus hypochondriacus): Golden flower heads produce copious amounts of white seed perfect for using as grain. The green leaves are edible but not the best tasting. Growing amaranth is easy due to it being a tough plant that will grow in many soils. 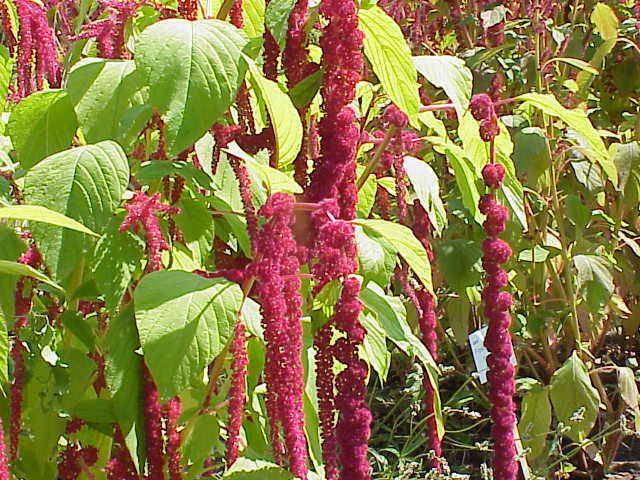 However, amaranth prefers a well-drained loose soil rich in nitrogen and phosphorous. Amaranth can be directly sown into prepared soil after the last risk of frost or started indoors 3 to 4 weeks before the last frost. Thin plants to 18 inches apart after they have sprouted. Amaranth is a hardy plant and largely care-free once established. Harvest amaranth leaves as needed. Younger leaves are better raw while the older leaves are better cooked. About 3 months after planting, amaranth seeds will be ready for harvest. You can test if they are ready by rubbing the flowerheads between your fingers and checking if seeds easily fall out. Birds visiting your plants may also be a clue that seeds are ready. 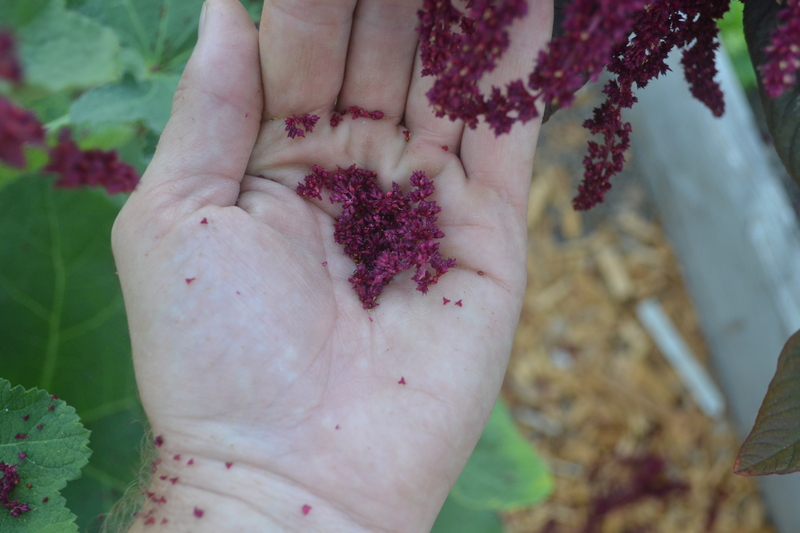 Harvest amaranth seeds by placing a clean bucket under the flower heads and rubbing the flower heads between your hands. The ripe seeds will fall into the bucket (along with some chaff, spiders and anything else living in there). You can then winnow the chaff by gently blowing it away from the seed. Dry the seeds further in the sun until they are completely dry. You can then store them in a cool dry place for up to six months. If you shake mature flowers the seeds will fall out along with chaff that you can lightly blow away. 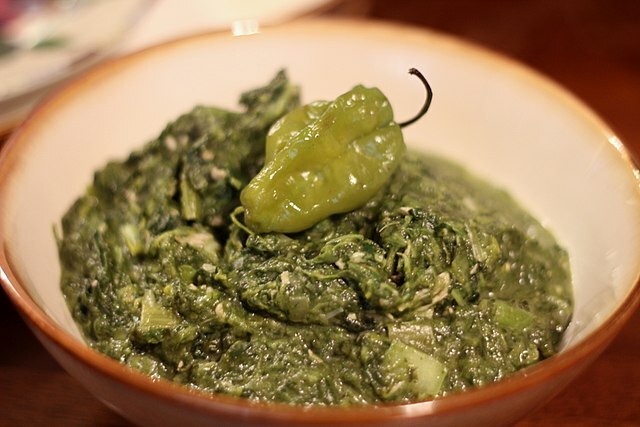 Callaloo is a popular Caribbean dish that originated in West Africa. Different versions are found across the Caribbean. 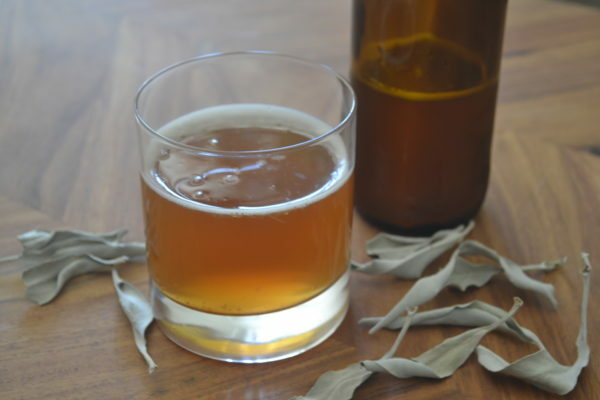 The following recipe is based on a Jamaican recipe. Soak the amaranth leaves in cold water for 5-10 minutes. Chop the onion, garlic, tomato and pepper. Set aside. Remove amaranth leaves from water and finely chop. Heat oil in a saucepan over medium heat. Add onions and garlic and stir for one minute. Add tomato, scotch bonnet pepper and smoked paprika. Sauté for about 2-3 more minutes. Add the amaranth, thyme, salt and black pepper. Mix all of the ingredients together, add the water and cover. Cook over medium heat until the stems are tender, about 8 minutes. The raw red amaranth leaves in this recipe create interest and carry a similar taste to spinach. Recipe adapted from www.101cookbooks.com. Make the dressing. In a mortar and pestle, smash the garlic and chile flakes into a paste along with the salt. Alternately, you can use a food processor. Add the oil and the scallions, and smash or chop a bit more. Transfer the mixture to a jar or bowl, and whisk in the coconut milk, then the lemon juice. Taste, and adjust with more salt or lemon juice if needed. You can store the dressing in a refrigerator for up to a week. Combine amaranth leaves in a bowl along with the tofu and basil. Toss gently. You can either dress at this point or serve the dressing on the side. Garnish with avocado. This salad mimics Mediterranean quinoa salads but substitutes amaranth. I like to make a large bowl of this and slowly eat it over the next few days, the flavor matures over time. If you don’t grow your own amaranth grain or need extra you can purchase it at health food stores or here. 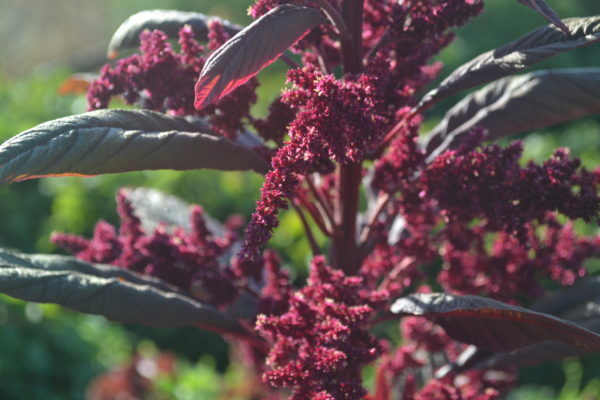 Cook the amaranth by bringing 3 cups of water to a boil, adding 1 cup of amaranth and reducing heat. Stir occasionally for 20 minutes. Let cool. Meanwhile, in a small bowl whisk together minced garlic, apple cider vinegar, honey and olive oil. Add salt and pepper to taste. 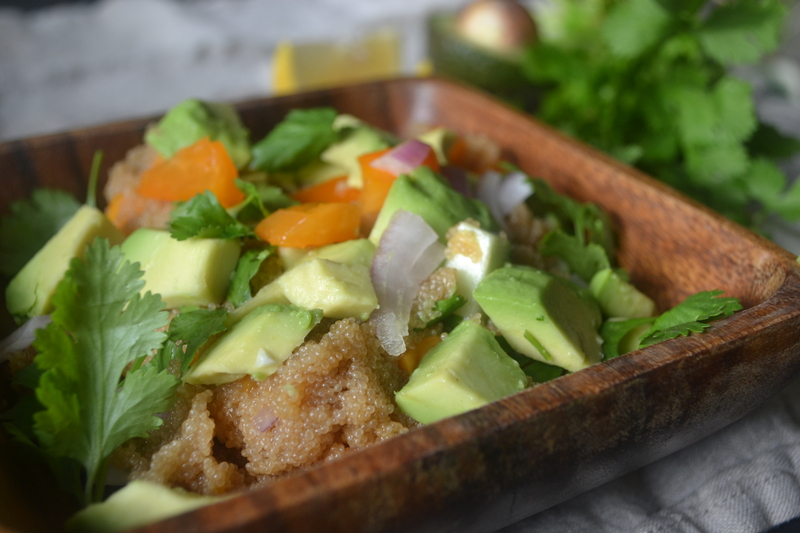 To make salad, combine cooked amaranth, tomato, cucumber, red onion, jalapeño and cilantro in a large bowl. Toss the salad with the dressing and refrigerate for a couple hours to let flavors meld. Let us know if you are growing amaranth and how you use the plant in the comments below.